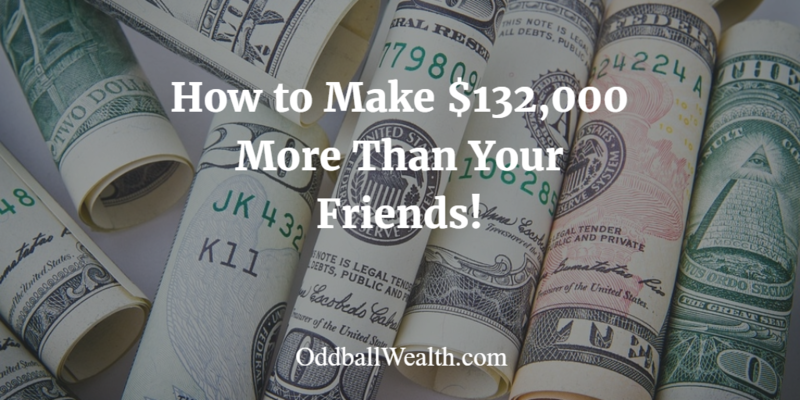 Want to make thousands of dollars more than your friends? You can earn more money by following the simple investing technique I’m about to show you about ways to make money. For this investment strategy to work you need to start saving and investing early (the younger you are the better! ), automate your investments, and sit back and watch your money grow. Many people never begin investing or delay starting to invest because they don’t know where to start investing, how to start, or what to do when they do start. The most important thing is to just start. Don’t worry about all the technical details right away. The worst thing you can do is to do nothing at all, especially if you’re young and in your twenties. If you’re currently not investing because you “don’t know where to start” or “don’t know how,” check out Betterment. They’re an outstanding automated investment service that charge extremely low fees. They also manage all your investments for you so you don’t have to. Just click this link to go to Betterment’s secure website. Then click “get started,” and they’ll walk you through everything! If you look carefully at the infographic above, it shows two people. On the left side is Awesome Mike, and on the right side is Lazy Joe. As you can see, Awesome Mike invests much less money, but actually ends up with around $130,000 more than Lazy Joe. One of the best ways to make money is by starting to invest early! Starting at the age of twenty-five, Awesome Mike invests $200 per month for 10-years, then stops making contributions at the age of thirty-five and never touches the money inside his account. Lazy Joe likes to procrastinate, doesn’t understand basic math very well, and doesn’t understand the power of compounding interest. As a result, Lazy Joe doesn’t begin investing until he’s thirty-five years old and ends up investing $200 per month until he’s sixty-five. Here’s why you should start investing early: Lazy Joe invests money for thirty-years and Awesome Mike invests money for only ten-years, but Awesome Mike earns more money. And this is only investing $200 per month for ten years, then stopping the monthly contributions, and just letting the account grow on its own. The most important factor to building wealth and achieving financial freedom is starting early. Cool Services You Might Like! ⟵How I Get My Credit Report, Credit Score, Credit Rating, Credit Protection and Credit Monitoring All Free! This post title got me in! A great simple example of how investing early works so much better! I’m sad to say I’m closer to the 35 than the 25, but glad to say my husband and I started saving and investing from a young age – you can’t get that time back! That’s awesome Christine! Saving and investing early is key! Thanks, great post. I find your opinion quite interesting, but the other day I stumbled upon a completely different advice from another blogger, I need to think that one through, thanks for posting.